Graham Hancock’s ‘lost civilisation’ needs to be located somewhere that renders it more-or-less invisible to present day archaeologists. Why? Because if it were just about anywhere in the world as we know it, scholars would have debated the age and achievements of this incredibly early civilisation for many years. This is the advantage of ‘losing’ a civilisation: if it cannot be seen, it cannot be debated by orthodox archaeologists. Fortunately for Hancock and his followers, there is a candidate for the location of this civilisation that is not only inaccessible, but also possesses conditions that would have completely obliterated all traces of it: the place is Antarctica. Not only does the former land surface of Antarctica lie buried beneath thousands of metres of glacial ice, but also the movement of that ice over the millennia will have churned up and shattered any trace of what may once have existed on the surface. It is quite evident from the chronology he proposes that Hancock’s ‘lost civilisation’ is meant to be Atlantis, yet he stops short of naming it. In Fingerprints of the Gods, he mentions it only twice, once to dismiss a mid-Atlantic continent as a geophysical impossibility. He’s right, of course, but this doesn’t stop him from talking about an ice-free Antarctic and initially identifying this with the home of the supposedly missing civilisation. The problem is that it’s equally a geophysical impossibility for Antarctica to have become covered in ice as little as 12,500 years ago (as Hancock requires). It’s so simple to disprove, too: ice is laid down in annual layers that can be counted, just like tree rings. How many layers can be counted? Hundreds of thousands. Nevertheless, he feels free to ignore this – perhaps he believes that there is some other mechanism that produces these ice layers – and seizes on an idea known as ‘earth crustal displacement’ to explain not only how an ice-free Antarctic might have been possible in the geologically recent past but also how the European Ice Age was caused. The hypothesis suggests that the earth’s crust is poorly attached to the planet’s core and that, for reasons that are not fully understood, can suddenly slip, creating new locations for the poles. The weight of polar ice is one of the causes for these shifts. It almost goes without saying that orthodox geology does not accept this idea. Whilst we now know that the tectonic plates making up the earth’s crust do move, they do so independently of each other, very slowly and never in the catastrophic way suggested by the crustal displacement hypothesis. Hancock has discovered references in the work of Charles Hapgood (1904-1982), who proposed the crustal displacement hypothesis in the 1950s, to a series of maps that appear to depict an ice-free Antarctic. These maps date from the sixteenth to the eighteenth centuries and, if the claim that they accurately depict an Antarctic continent – ice-free or otherwise – is correct, they are remarkable, as Antarctica was not discovered until the 1820s. It is therefore important to examine the claims in detail. There are insurmountable problems with accepting any of the sixteenth- to eighteenth-century maps as evidence that Antarctica was free from ice at a time when humans might have mapped it. The greatest problems relate to relative sea levels and to the current isostatic depression of the landmass. 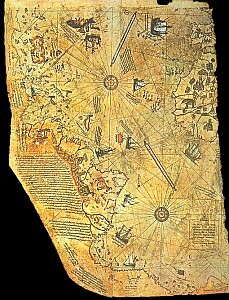 Nevertheless, if it could be shown that the maps do contain genuinely ancient information about the form of the southern continent in the remote(ish) past, this would be a major boost for Hancock’s theories. The maps are reviewed elsewhere on this site: they do not show what Hancock and others claim they show. However, there is a more important source of information about the age of the ice cap that completely refutes Hancock’s assertion that ‘crustal displacement’ (an hypothesis first propounded by Hapgood) led to the glaciation of Antarctica as recently as 12,500 BP. This is the existence of numerous ice cores from the Antarctic that show the continent to have been covered by a fully developed ice cap between 40,000 to 6,000 BP. Between 21,000 and 16,000 BP there was a maximum development of the ice cap, corresponding to the height of the Devensian glaciation in Britain. Indeed, it is evident that Antarctica was last completely ice-free over 34,000,000 years ago, long before the evolution of the genus Homo, let alone modern humans. After the mid 1990s, Hancock came to accept that Antarctica was not a likely home for his lost civilisation. Instead, he became interested in the phenomenon of rising sea levels at the end of the Pleistocene, as the polar ice caps shrank, and developed an hypothesis that his lost civilisation had occupied the now drowned continental shelf and that it was a truly worldwide civilisation. Learn to spell civilization and maybe Ill believe you jackass. Civilisation is spelled correctly; I’m English, so I use English spellings, not American. It’s a word with a Latin root (civis), so it shouldn’t take a Greek -ize suffix. Learn something before you start insulting others. call people names. So who really is the jackass? YOU are. I’m not at all sure where I’ve called anyone names. Point out where I did and I’ll apologise. I think Jim was talking to Lol. I have been browsing YouTube videos on “Out of place artefacts” and the like (many of which you’ll no doubt hate!) and seen a couple about the stone carvings and structures of Puma Punku (I think in Peru?). My question – do you believe that they are evidence of ancient advanced technology as the videos would have you believe? Or are they easily explained but the level of difficulty in creating them is being misrepresented? The videos would have you believe that it was downright impossible to create these stones using only the technology that it is widely accepted that they would have had at the time. It is said that some of the stones could only have been carved by the types of diamond-tipped drill bits which we have nowadays. I’m interested to hear any thoughts you may have on this (with specifics, if relevant, as to where we are being misled with such videos). Does anyone have a minute to respond to my earlier post and maybe shed some light on this? It would be impossible today to produce those structures. Repeating the lies told you by fringe authors and ridiculous television programmes doesn’t make them true, you know. It would help me to reply if you’d actually said which structures, by the way! Or those who refuse to look at evidence. Actually Keith I have to quibble with your main text slightly. It is now fairly well established that the onset of Antarctic glaciation began around 34 million years ago, not 14 million. See, for example Robert M DeConto and David Palland  Rapid Cenozoic glaciation of Antarctica induced by declining atmospheric CO2 Nature v421 for 16/01/2003. But the main thrust of your argument is correct. While the Antarctic ice cap may have been somewhat larger and deeper at the Last Glacial Maximum, much of the extent of the ice was sea ice. And while there has been general global deglaciation since then, there is no evidence that despite this, that Antarctica has ever been deglaciated. The recent series of Antarctic deep cores reported by EPICA members  Eight glacial cycles from an Antarctic ice core Nature v 429, p 632-628 for 10/06/2004 go back for 740,000 years and if my reading of the article is correct, nowhere is there recorded a recent ice free period. As we now know, seal levels were around 120 m below modern levels during the Last Glacial Maximum because of the huge amount of oceanic water locked up in the ice caps. If Antarctica had undergone substantial melting, in addition to the Laurentian, Cordilleran and Fennoscandian ice sheets, modern sea levels would be substantially higher than they are now. 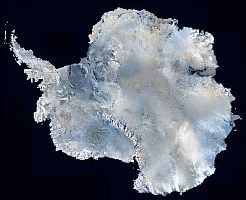 The fact that they are not gives the lie to the idea of an Antarctic based civillisation. And it has to be asked: why, with the whole wide world to choose from, would anyone want to colonise the most forbidding climate on Earth? Thanks for the correction: I’ve updated the text. All well and good, but just supposing for a moment: what if a high-technology civilization existed in the Antarctic at some point in history? One with technology sufficient to survive the elements? If such an advanced civilisation existed, it ought to have left traces. Given that any human civilisation could not have developed there before Homo sapiens left Africa (around 70,000 years ago), it would have been established either on, within or beneath a constantly moving ice sheet, it would have had to develop a means of anchoring its structures to the bedrock to avoid habitations, workplaces and infrastructure being broken apart constantly. These traces would remain, if not the structures themselves or, at the very least, their anchor points. There is also the point that every human society that we know about produces waste, both biological and technological. An advanced civilisation often has ways of dealing with human waste that involve removing it from the immediate vicinity of habitations and transferring it to places where it can be stored and broken down. Today we have sewage works; in medieval England, they had sewers and night-soil collectors, despite the popular view of streets running in filth; in rural Roman Britain, they had cesspits. All have left traces. Any civilisation existing in a glaciated Antarctica would have required a massive infrastructure to deal with its waste, otherwise the place would have been covered with frozen urine and faeces. That is without thinking about the food waste and the general rubbish that all societies generate. What about food supply? Lacking the conditions to grow crops and rear livestock out-of-doors, there would have to be either huge areas of artificially controlled environments or an efficient system of importation by sea or air. Either option would need truly massive infrastructure; in the former scenario, this would be in the form of permanently anchored structures on the continent, while the latter would require not only transport infrastructure within Antarctica but also in nearby temperate areas (South Africa? Australia? Argentina? Chile? New Zealand? ), where there would also have to be the remains of agriculture sufficiently extensive to feed external populations. No, the idea of an advanced civilisation on an already glaciated Antarctica raises too many issues about why we can’t see it. This is why Graham Hancock wanted an ice-free Antarctic, as the development of the ice sheet would have destroyed all the evidence for his non-existent “Lost Civilisation&rdquo. And what questions, exactly, would hypothesising a civilisation in the most forbidding environment on the planet actually answer? I would guess that you consider both the biblical record of Noah’s Flood and the records of just about every civilization as being worthless nonsense. A global catastrophy that not only washed away just about everything and burried it also would answer why there are little to no traces of what was here previously. It’s true we have fed a lot of nonsense especially when they tell us it was all done by Aliens from UFO’s but please, there is so much that is factual if you would just care to research rather than insult. How about checking out this info. This is the last paragraph in the article, but then again that may also be untrue as far as you are concerned. The “biblical record of Noah’s flood” is no such thing: it’s a story, written down millennia after the event it is supposed to be narrating. More than that, it’s plagiarised from a Babylonian story, which itself derived from an Assyrian story, which derived from a Sumerian story. So it’s a long way from being a “record”. On the other hand, a brick bearing a cuneiform inscription of King Sargon II, found in strata of the right date, or a stone relief on a temple erected by Thutmose III do constitute records. They are not “worthless nonsense”. What’s especially interesting is that none of the genuine records of ancient civilisations show any evidence for the devastating effects of a world-wide flood. Mud brick structures of the pre-Dynastic and Archaic periods in Egypt, mud brick structures of the early phases of occupation at Uruk and so on do not show any evidence of being affected by a flood that occurred centuries after they were built. If you want a Noachic flood, you have to push it back much farther in time. The Orontius Finaeus map does not show an ice-free Antarctica: it is an imaginary depiction of what Finaeus thought a southern continent (for which he coined the name Terra Australis) ought to look like. Hapgood’s work has to be lumped in with the lunatic fringe, as his ideas on “crustal shift” have been completely falsified by modern plate tectonics and, more devastatingly, by palaeomagnetic studies of volcanic rock, especially on the seabed. The idea that “U.S. Air Force SAC cartographers… fully endorsed his conclusions about Antarctica” is just not true: it’s one of those things that gets repeated a lot but nobody ever presents any evidence to back it up. It seems to derive from an unsupported assertion in Le matin des magiciens, a veritable gold-mine of unsupported data that is much used by fringe writers. Jim, you are arguing with common sense here. If a flood destroyed this supposed civilization so completely that practically nothing of it remains today, how did it leave enough of it for supposed post-flood societies to build civilizations of their own? Dude, once again, your arguments are completely pathetic. Just in another topic you wrote how they found a papyrus from the “foreman” who helped build the pyramid. Yet you believe that as 100 percent fact, but the flood is too hard to believe. You are simply only believing in the items that suit your own personal beliefs. The truth is that you are clueless on these matters of what is 100 percent fact or conjecture. The habitation sites of the work crews that built the pyramids along with their artifacts, bakeries, breweries and detritus exist to support what the ancient construction foreman wrote in his diary while NO evidence exists to support the Biblical flood. I don’t mean to sound like I am disagreeing, but how does one go about dating an ice core exactly? Just because they are in layers, doesn’t mean that each layer took 100 years. I’m just curious. No, each layer is an annual development (summer/winter); if anything, climatic vagaries lead to under-representation of years. All you need to do is count the layers. Bits of volcanic ash, with their specific chemical “signatures” allow cross-referencing between cores from different sites. The whole thing is so logical, so simple and so robust, it’s beautiful! Again, something that may carry some validity, becoming mired in confirmation bias. Recognizing the people who may contribute relevant data to this field should be fairly easy. In the rush to produce a product, you take the pieces that fit, and cut up the ones that don’t. Judge based on relevancy, not context. And remember, products produce profit. Bandwagon ideologies (such as this topic) due to the porous nature and ambiguity of the data, are immediate suspects to scholars and attractive targets to harlequins. I wholeheartedly believe (enough to dedicate a Masters thesis to the subject) that the information and data is there. But no one is willing to take all they’ve learned (on both sides of this argument) and either accept opposition data and incorporate it, or admit a theory is wrong and start again. This isn’t a debate about availability of information, but, to me, speaks to the indelible nature of humans and our need to be right. The potsherds are out there, and we will find them. I hope ego doesn’t ruin our best opportunities. This website has Some posts dedicated to such maps as well as Hapgood’s ideas. I recommend you read those. One simple question to the author of the original post: You state that the entire continent of Antarctica was not discovered until the 1820s. If this is true then how can any form of a great southern continent possibly exist on any map which was created before 1820? Did these people just imagine a land mass existing there just to drew it on there on the odd chance they were right? After all the explanations you made to prove Hancock wrong; I find it interesting that you left this one out. Theoretical geographers (no, I wasn’t previously aware that such a thing exists) postulated a southern continent for a variety of reasons. One was to ‘balance’ the weight of the continents in the northern hemisphere; another was to account for the presence of icebergs in the southern ocean. If you look at the pages dealing with individual maps (especially that dealing with Philippe Buache’s map), you’ll find that I have gone into the reasons why earlier geographers confidently drew an Antarctic continent. Thank you for your intelligent and interesting research. The quest to find the truth is certainly a journey fraught with difficulties – to accurately source your materials is a career in itself, especially with the massive amount of pseudoscience, conjecture and historical dogma that refuses to go away. Did the pople have enough time to leave antarctica when it started to cool down >\? After reading through this site more I’m finding myself agreeing with kieths point if view than many others in the comments, although I think the Portolans, or mappumundi (I haven’t a clue how to spell it) are a series of actual maps with relatively reliable cartography of the known world, along with apparently similarly accurate representations of yet undiscovered continents. I could be wrong, I’ve just read about them in a few places and have always come away with the idea of a series of maps not just an idea of a possible landmass. As well, within these articles the premise was held that these maps were copied from older maps, and this was supposedly indicated on the Portolans themselves. This is just from memory, could you clear this up kieth? My understanding is that portolans were first developed in the thirteenth century as an aid for mariners; a mappamundi is rather different, being often more schematic. Portolans by definition contain no continents outside the European/African/Western Asian landmass, as they fit the then known world into an oval. Sometimes they include mythical islands in the Atlantic (such as the Island of St Brendan) and the highly problematical depictions of Markland and Vinland on the Vinland Map. Mappaemundi are usually too schematic to show anything that could be considered an unknown continent, although some contain a fourth continent east of Asia and Africa that they term Antipodes. None of these maps claims to be based on accurate ancient originals apart from those that are based on the Geographical Summary of Ptolemy, which dates from the second century CE (although his original maps are lost, the coordinates in his text allow them to be reconstructed on a variety of projections). Why do you think that it “is met with adamant opposition by mainstream scientific fields”? It’s because there is not one shred of credible evidence to support it. Put this alongside the mass of evidence we do have from human prehistory, which gives a picture of human cultures extending back a couple of million years, and you can see that there is no need to hypothesise an ancient technologically advanced super-civilisation in the remote past. As for Hancock’s use of the Piri Re‘is map of 1513, I’ve done an analysis of it here. You might want to take a look at that before claiming that the map uses “plane and spherical trigonometry”, because it certainly doesn’t. Piri was quite explicit about his sources. Hancock and Hapgood before him simply ignored all the writing on the map. The fact that one of the twentieth-century’s greatest physicists wrote an endorsement of Hapgood’s first book on cartography is irrelevant: you wouldn’t respect Beoncé’s opinion on the engineering of the Hoover Dam, would you? Einstein didn’t “support” Hapgood’s “findings and research”: he merely said that Hapgood’s hypothesis of crustal displacement was worth investigating further, which is hardly the same thing. And remember that this was before the discovery of plate tectonics (which, I agree, is “awesome”). As foe Eisely’s work on climate change as the mechanism for the late Pleistocene extinction of American megafauna, the pendulum has swung back the other way. There is now convincing evidence for the role of humans in that extinction (probably as one of a number of factors, including habitat loss as a result of climate change, although that process was too slow to be the sole cause of the rapid extinction implied in the palaeontological record). It is not perverse to implicate humans in the extinction. There are, of course, many things that we don’t (yet) know as well as some things that we can never know. The scientific process is one of constant discovery, challenging and overturning accepted theories, and formulating new hypotheses to explain observed phenomena. Who would have thought, twenty-five years ago, that epipalaolithic hunter gatherers in eastern Turkey would have created a ritual centre? Yet we now have Göbekli Tepe: not evidence for a super-civilisation at the end of the Pleistocene, but a completely unexpected insight into the social complexity of late Palaeolithic peoples and a different way of looking at the origins of settled life. Einstein ‘approving’ of Hapgood’s ‘hypotheses’ is neither here nor there. Was Einstein a geologist? Perhaps further research will confirm he changed his mind? Anyway, it’s just the old argument from authority fallacy. If I understand it correctly there are no unambiguous signs of agriculture anywhere in the world before 10,000 BC. During the period 10,000 – 8,000 BC signs of developing agriculture are only found in seven regions. These are the Ethiopian highlands, parts of West Africa, northern parts of the Middle East, parts of eastern China, the highlands of New Guinea, the Andean Altiplano, the Amazon, southern parts of Mesoamerica, and parts of south-eastern United States. The southernmost of these was the Andean Altiplano, which is rather close to the Equator. Also, a civilisation which ruinously got to and from Antarctica could easily have reached New Zealand. Yet there are no unambiguous signs of any humans in New Zealand before 1200 AD when the ancestors of the Maori arrived. Graham Hancock’s idea of an ice-free Antarctica is just a pipe-dream. During the time humanity have existed Antarctica was always more or less ice-covered. The size of the Antarctic ice cap has varied during the past few hundred thousand years between three phases. These can be described as a “warm”, a “cold” and a “middle” one. The “middle” phase roughly corresponded to the present day situation. This means a larger East Antarctic ice sheet and a smaller West Antarctic one. The West Antarctic ice sheet is connected to two larger ice shelves covering two bays (they have salt water underneath the ice). During “cold” phases these two froze to the bottom extending the West Antarctic ice sheet. A continuous ice shelf seem to have surrounded the entire continent. On the other hand, there does no seem to have been any ice shelves at all during the “warm” phases. During these the West Antarctic ice sheet melted away altogether while the East Antarctic one remained largely intact. The area covered by the West Antarctic ice sheet today was mostly flooded by the sea. (The Antarctic Peninsula and the connected mountains seem to have been an island.) The parts not flooded would have been too cold for agriculture. So why build a civilisation there? Also, since the entire world’s climate is a single system I think “warm” phases could only take place during interglacials (the periods between ice ages). Similarly, the “cold” phases could only take place during ice ages. Since the temperature curves of the hemispheres are a bit out of sync with each other the “middle” phases could potentially take place during both. I doubt there’s a lost civilization on Antarctica, but can be possible. But Antarctica has layers and layers of ice, it’s impossible to find out. I am sorry to see Graham Hancock debunked. But his theory of there being a lost advanced civilization has much evidence beyond Antartica and the Piri Ris map. But the evidence he presents doesn’t stack up. He either misrepresents what is already known or uses material of very dubious authenticity. For my analysis of his South American “evidence”, take a look here. I did intend to write a complete analysis of Fingerprints of the Gods, but I got bored. Plus, I have a life outside Bad Archaeology!